Seriously obsessed. I read the book series at least a dozen times. 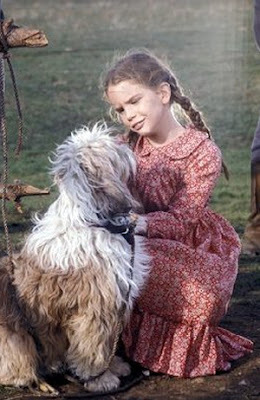 I waited for Michael Landon and Melissa Gilbert to appear on TV each week, Pa crying dramatically while Half-Pint saved the family farm and outwitted resident meanie, Nellie Oleson. I wore a dress and bonnet, created by my amazing Aunt Georgianna, who lived on a farm. Every summer, I'd visit her for two weeks. We shared a June 16 birthday. You think I'm kidding about my obsession? Still—life happened. 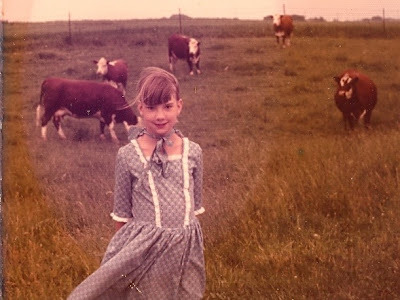 I grew up, discovered boys, went to college, and didn't think twice about farming. I worked in publishing, then PR and advertising, only getting my hands dirty when I planted some pansies on the weekend. Who knew that one day my Laura Ingalls obsession would resurface, and I'd make my living from seeds and soil? When I was taking authors to wine-laden dinners and staying at the Ritz-Carlton, I never dreamed I'd be digging in dirt. Well. I wish I had gone to Brenda for career counseling a long time ago. I told her, quite honestly, that I had no idea. I imagined there might be some chickens, but I couldn't promise her a barnyard filled with animals. Our purpose was to work on the farm, learn more about organic growing, eat an organic lunch, and help as needed. Although a little worried about the organic, vegetarian lunch, Kristen agreed to go for the slight chance she might meet some new animal buddies. Here's the thing about my girl: she loves nature. She loves animals. Who was this alien child? Was she switched at birth? I suppose this should have been a heads-up about our mother/daughter farm-day experience. Organized by Greenville Organic Foods Organization (GOFO), a fantastic organization dedicated to promoting healthy growing and eating in the Upstate, the work day at Bio-Way Farm served as an opportunity for foodies, greenies, and wanna-be farmers to learn more about organic growing practices--while benefiting our host farmer with some free labor. And we did labor. Whew. Located in Laurens County, South Carolina, Bio-Way Farm is a 120-acre certified organic farm that embraces permaculture principles--designing ecological human habitats and food production systems. Permaculture started with the belief that for people to feed themselves sustainably, we need to move away from reliance on industrialized agriculture, which is powered by fossil fuels and promotes monocultures of crops. Instead, permaculture stresses the value of working with the Earth in mutually beneficial relationships. For instance, rather than clear an overgrown field with traditional gas-powered machinery, install a herd of goats who will eat the brush and foliage, while also fertilizing the ground for future crops. Agriculturalists traditionally exploit soil, plants and animals, which leads to diseases, soil erosion, pollution from fertilizers, and even illnesses from factory farms, as witnessed in our recent egg recall. Permaculturalists practice agriculture by looking forward, maintaining the health of the land—and our food systems. Apparently, I'm not the only person excited about sustainability. When Kristen and I arrived at the farm, there was already quite a crowd...19 in all. Kristen was the youngest, but there were two teenagers attending to earn school credit—but I'm pretty confident they had a good time regardless of why they signed up. Viviane greeted our crew, outlining the day's events and introducing Chris Sermons, our host at Bio-Way Farms. Chris, his father and step-mother founded Bio-Way, planting 2000 asparagus crowns in 2004. In addition to fields of asparagus, they grow many varieties of seasonal produce, as well as fruit and berry crops. With 20 acres devoted to growing produce, the family strives to preserve biodiversity within its 100 acres of hardwood forest. They work to control exotic invasive plants while reintroducing native plants, which helps to restore wildlife habitats. Surprisingly, the farm is worked by Chris. Just Chris. And occasional volunteers. And sometimes, friends. Twenty acres, one full-time farmer. But their asparagus? Oh. My. Next spring, you definitely want to find them at the Greenville Farmer's Market or through Upstate Locally Grown. Even my kids ate their asparagus when I bought it last spring...without too many bad faces. Our goal for the farm day was to learn about sustainable growing while helping Chris get some work done. Win-win. We were down to 18 workers. Kristen took off with the dog after about 15 minutes. No chickens, but the dog would do. So much for my dreams of working the land with my girl. Instead, I met an amazing assortment of farm hands: a retired dairy farmer married to a city girl; greenies who wanted to learn more about gardening; a young woman whose progressive employer has an organic garden for its employees; an herbalist with an adorable vegetarian son; a young man who thought farming might be his calling (but, quite honestly, I think he changed his mind after he realized the amount of work); and lovely, pleasant people just interested in better understanding sustainability. Have you ever seen a Jerusalem artichoke? Stay tuned for a recipe using these funky tubers. After rounding up my girl from the swing, we cleaned up a bit and headed inside for a gourmet organic lunch, prepared by Chef Heather Kalka. Have you noticed that I'm fixated with food recently? Maybe it's because we're in the midst of harvest season. Or maybe it's because there's just so much good food and I have no willpower. Anyway, I'm not a vegetarian, but if I had Chef Heather to cook for me—I could be. Amazingly delicious, healthy treats—delicious eggplant spread, scrumptious gnocchi, adorable blueberry tarts...mmmm. Yes. Just bread. And water. It was a jailbird diet. After lunch, Kristen disappeared with the dog—and newly found cat—while we toured the farm. Chris showed us the acres of asparagus, a recently constructed greenhouse, the irrigation system, and my favorite—his experimental woodland garden. The woodland garden was fascinating, particularly since our property is forested. Kiwis, blueberries, pawpaws, herbs...it was amazing to see what Chris grows in the forest, with only dappled sunlight. My next venture? Mushrooms. And blueberry bushes throughout our forest. As Chris wrapped up the tour in the area devoted to a native plants nursery, I heard a strange squeak and saw Kristen racing toward the black cat, Rosemary. As we watched, my darling daughter pried a baby field mouse out of the cat's mouth. The rest of my farmer buddies now understood I was telling the truth about my daughter. Well, perhaps she's not going to be a farmer. But maybe she's more like Half-Pint than I thought. Peel the sunchokes and drop them in salted, boiling water. Cook until tender. Drain and cool. Cut into 1/2-inch slices. Smear the bottom of a baking dish with butter, then place the sunchoke slices in it, arranging them so they overlap slightly. Sprinkle with salt, pepper, and the grated Parmesan, dot with butter and place the dish on the uppermost rack of the preheated oven. Bake until a light golden crust begins to form on top. Allow to settle for a few minutes out of the oven before serving.